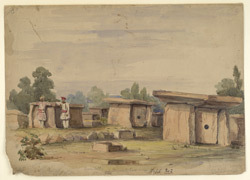 Watercolour by Philip Meadows Taylor (1808-1876) of stone cist graves at Rajan Kollur in the Gulbarga district of Karnataka, dated 1850. The image is inscribed on the front, and on the back, in pencil with notes and: 'Druidical Cromlechs and Kistvaens at Rajunkolloor, Shorapur District'; and in ink:' No. 2.' This is the original image for Sketch II of Taylor's 'Descriptions of Cairns, Cromlechs, Kistvaens, and other Celtic, Druidical, or Scythian Monuments in the Dekhan'(Dublin 1865). Cists or Kistvaens are ancient graves or stone coffins found at various sites around the world. They usually consist of a square or rectangular area, which may contain either a skeleton or a burial urn, surrounded by either a mound of earth and a circle of stones, or four stones covered with a large flat rock roof. Taylor wrote, "In the year 1850, my attention was first attracted to these ancient remains, by observing the large group of cromlechs at Rajunkolloor, in the principality of Shorapoor...of which I was then Political Superintendent...Many of the closed kistvaens had round holes in the centre of the slab on the south side...The slabs of stone, of which the largest monuments at Rajunkolloor are constructed, were obtained from a very peculiar formation, which exists about three miles to the west. Here granite, in a state of fusion, has disturbed the stratified limestone and sandstone, and to some extent vitrefied both; and the latter-named material, though much more difficult to quarry, was preferred to the stratified limestone, which could have been obtained close by. It is difficult, however, to conceive how those large slabs of stone were quarried - for the rock is very hard- or transported to their present locality."